Carbone has incorporated into its product line MIG machines and accessories in Costa Rica for any type of work required. The MIG machine can weld with or without gas and its real work cycle is of 35 % at maximum capacity. It is suitable for welding all kinds of carbon steel, stainless and aluminum materials. Its smooth arc and low spatter with simple controls for quick adjustment, which even a beginner, can quickly adjust. It also has a European torch connection for quick installation and uninstallation field and IGBT inverter modules that will give years of use. They can weld thicknesses up to 3/16 ” in a single pass, 3/8″ in several passes and a minimum size of 24 calibers. 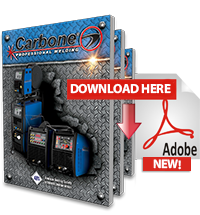 Carbone introduces its new line of welding machines. 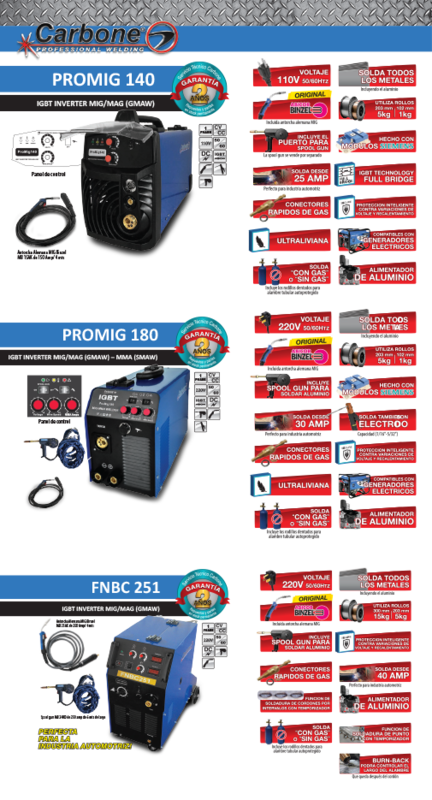 With our MIG machines catalog you can meet the widest range of machines for MIG welding. We offer a variety of machines with various regulations and features to perform any work you need.